It's no secret I flippin' love Dante. Go see why here. The Collector made me laugh out loud more times than I can even count. I love Victoria's snark, sarcasm, and gripping writing style. So naturally... I need more!!! What are you guys waiting on this Wednesday? More Dante! More Dante! More Dante! :D The Collector was awesome. :D Right?! I can't wait! I loved The Collector! I love books that make me laugh out loud! I'm looking forward to this one as well! Oooh, yes! The Collector is a lot of fun. Oh Scott- you need to! It's so funny! Yikes, I need to get going & read my copy of The Collector! This sounds like an epic follow up, I hope you can get a hold of it soon :D Fab pick doll & thanks for sharing! Thanks Micheline! I can't wait to hear what you think once you read it! I've heard great things about the Collector, but haven't read it yet. Sounds like I should track down a copy. Great pick, Jess! Thanks Natalie! Yes! You need to meet Dante!!! Ah, Dante. I can't wait. Aww bummer Kelly! I've heard from a few people they didn't care for it. But yes, I love the guy model on the covers! LOL. :D Let me know what you think once you do! 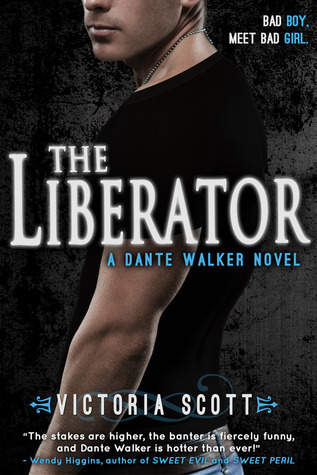 i've been wanting to check out the dante walker series. the dude on the cover is hot! Haha! He is super hot! I like this series! Hopefully you will too once you get to it! Yes!! Can't wait for this one either. The ending of The Collector left me dying to find out what's coming next. XD Great pick! I know! I can't wait to see what happens with Dante and Charlie. He'd better not screw it all up! :D Not *too* much longer and we'll have it! I need this one! Need my Dante! Sigh. Dante. Need more of his sarcastic, witty humor! Thanks Jaime! I can't wait to see where she goes next! I hope he doesn't mess up things with Charlie in this one or I'll have to smack him upside the head!!! RIGHT?! I will be so pissed at him. Grrrr. Yes! I hope so too! Definitely going to try and join the blog tour for it! I have yet to read the first book of this series but they do look like a good read! Can't wait to hear how you like this one. Thanks for stopping by Brenna! Great choice! The first book in this series sounded really good though I still have to buy a copy! Best. Pick. Ever. Need more Dante already! Argh! And I flippin' adore Victoria Scott. I flippin' adore her too. She's so adorable. I still have not read the first book (sadly) but I am looking forward to when I do! Thanks for stopping by my post! Hehe *hi5* Dante Walker is so badass I love him! OMG YES!! I want this one!! Oh yes yes yes! I'm dying for this too! The Collector was amazing! Oh I hope you like it Nina! Its the perfect book to read when you're in a bad mood. It will make you laugh so much! *hangs head in shame* I still need to read The Collector and I was so excited for that one too! So I have no clue why I havent picked it up yet. I am seriously drowning in books! I need like a week where I just sit around and read! Great pick! OH man! Teresa- I think you'll really like the Collector! :D It's so funny! I am also drowning in books. And I'm on vacation! LOL. Thanks for stopping by my post! Sorry I'm super late to respond!